Yay!!! It's finally time to showcase the new stamps released from Stampotique this month with a blog hop!!! You should have arrived here from Samantha's blog. If you have just stumbled upon the hop, be sure to start from the Stampotique Designer's Challenge page so you don't miss a thing! As with every release, there is something for everyone! Check out Tracy Scott's first ever Stampotique images! We always love to hear what your favorites are, so leave us comments about your favs along the way for your chance to win a $30 gift certificate and a grab bag of stamps announced during the first challenge in August! I love the softness of your card, so sweet! I can't believe how different these flowers look stamped in this way on to patterned paper...gorgeous work Valerie. Those flowers brighten an otherwise dreary Monday morn.So happy with the new releases and new designers. 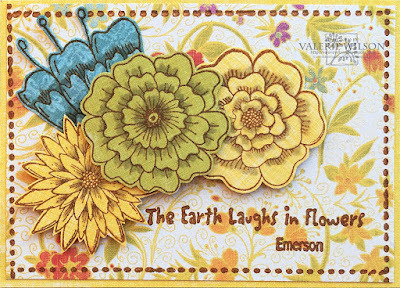 So beautiful with all the lovely new flower stamps! I love the soft colors you chose for the flowers! A beautiful card, indeed! awe, i really like this. Gosh you sure turned this into a very soothing creation which I love so much since I have a tendency to use bright colors all the time. Thanks for the prompt. Beautiful flowers <3 Your card is amazing Val! Those flowers are so cool and I just love the way you have showcased them here Val. So pretty. Those flowers are divine! Great card. Beautiful card Valerie, the flowers are gorgeous. This is great fun. Loving the samples from everyone. I can't resist the rocket ship so far but I know there's more goodies to come. Love your flowers too. Great background. Once these stamps seemed to me to be too macabre, but now I love them and I'm going to buy some of them. I love this new stamps and your card. Thanks for the beautiful inspiration and fun. Once these stamps seemed to me to be too macabre, but now I love them and I'm going to buy some of them. Thanks for the beautiful inspiration and fun. Lovely flowers, your card is great! I love these flowers! beautiful card! The quote goes perfectly with the flowers - beautiful! Great job and love the new stamps ! Love those flowers! Beautiful card!